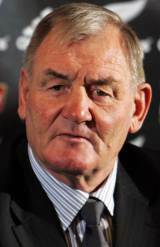 Sir Lochore has previously captained the All Blacks - playing at No.8 and lock as well as leading the national side to World Cup glory in 1987. A member of the IRB Hall of Fame, Lochore played senior rugby for the Masterton club and captained New Zealand against the British & Irish Lions in 1966. He continued as captain up until 1970. After finishing playing, he went back to Masterton as coach before moving on to coach Wairarapa-Bush in 1980. He became All Blacks selector in 1983 before becoming head coach of the All Blacks and led them to victory on home soil in 1987. He continued to be hugely involved with rugby and managed the side during the 1995 World Cup and is used as one of the All Blacks' selectors. He earned the honour of Knight Companion of New Zealand of Merit in 1999 and earned New Zealand's highest honour after being inducted into the Order of New Zealand in 2007.